نوری زاده, علی, گودرزی, محمود, علیدوست قهفرخی, ابراهیم, همایون نیا فیروزجاه, مرتضی. (1396). بررسی نقش حمایت مالی (تبلیغات روی پیراهن)در نگرش هواداران تیم‌های پرطرفدار لیگ برتر فوتبال ایران. 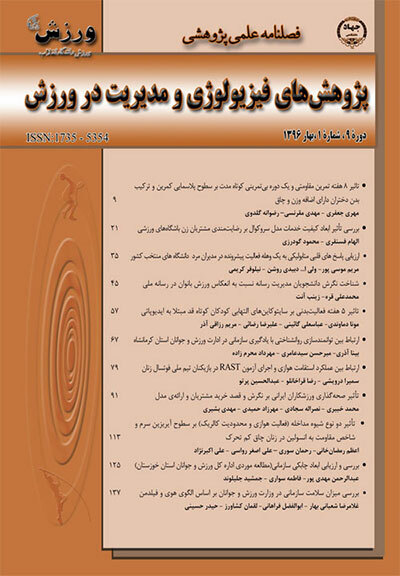 پژوهش های فیزیولوژی و مدیریت در ورزش, 9(2), 9-20. علی نوری زاده; محمود گودرزی; ابراهیم علیدوست قهفرخی; مرتضی همایون نیا فیروزجاه. "بررسی نقش حمایت مالی (تبلیغات روی پیراهن)در نگرش هواداران تیم‌های پرطرفدار لیگ برتر فوتبال ایران". پژوهش های فیزیولوژی و مدیریت در ورزش, 9, 2, 1396, 9-20. نوری زاده, علی, گودرزی, محمود, علیدوست قهفرخی, ابراهیم, همایون نیا فیروزجاه, مرتضی. (1396). 'بررسی نقش حمایت مالی (تبلیغات روی پیراهن)در نگرش هواداران تیم‌های پرطرفدار لیگ برتر فوتبال ایران', پژوهش های فیزیولوژی و مدیریت در ورزش, 9(2), pp. 9-20. نوری زاده, علی, گودرزی, محمود, علیدوست قهفرخی, ابراهیم, همایون نیا فیروزجاه, مرتضی. بررسی نقش حمایت مالی (تبلیغات روی پیراهن)در نگرش هواداران تیم‌های پرطرفدار لیگ برتر فوتبال ایران. پژوهش های فیزیولوژی و مدیریت در ورزش, 1396; 9(2): 9-20. می­سنجید. پایایی پرسشنامه با استفاده از ضریب آلفای کرونباخ 83/0 به دست آمد. . برای تجزیه و تحلیل داده‌ها از دو روش آمار توصیفی(میانگین و انحراف معیار) و استنباطی (آزمون تی تک متغیره) استفاده شد. نتایج تحقیق نشان داد که حمایت مالی(تبلیغات روی پیراهن) به ترتیب بیشترین نقش را در افزایش آگاهی و علاقه، نگرش مثبت به حضور حامیان مالی، ارتقای تصویر حامیان مالی، وفاداری هواداران به محصولات حامیان مالی و افزایش قصد خرید هواداران از محصولات آنها داشته است. در نهایت با توجه به نقش مثبت حمایت مالی در کلیه عوامل، سازمان­ها و شرکت­های تجاری می­توانند با در نظر گرفتن کمیت و هویت هواداران، حمایت مالی ورزشی در فوتبال را به عنوان یکی از راهکارهای موثر ترویج محصولات و خدمات خود در نظر بگیرند. The aim of this study was to evaluate the role of sponsorship (advertising on shirts) on the attitudes of fans of Iran football premier league popular teams. The research method was descriptive and application in terms of aim which was conducted as a field. The statistical population consisted of all (over 18 years old) fans of football premier league popular teams(Esteghlal, Tractorsazi and Persepolis) in 2012-13. Since the population size was over than 100000 fans, according to Morgan sampling table, sample had to consist of at least 384 fans. So, 500 questionnaires were distributed and 424 complete questionnaires with 95% responsiveness ratewere returned. A researcher-made questionnaire was used to evaluate the role of sponsorship on the attitude of fans in5 parameters: fans’ attitudes towards the reasons for sponsors, awareness and interest in the brand of sponsors, enhancement of the image of the sponsors, purchase intent and loyalty of fans. The reliability of the questionnaire was confirmed by Cronbach's alpha coefficient (α=0.83). Data were analyzed by descriptive statistics (mean and standard deviation) and inferentialstatistics (one-sample t test). Results showed that sponsorship (advertisement on shirts) had the greatest role in increasing awareness and interest, positive attitude towards sponsors, enhancingthe image of sponsors andthe loyalty of fans towards the products of sponsors and increasingthe purchase intent of fans respectively. Finally, according to the positive role of sponsorship in all factors and with an emphasis on fans’ quantity and identity, trade organizations and companies can consider sport sponsorship in football as one of the effective strategies to promote their products and services. احسانی، محمد. ابودردا، زینب و اقبالی، مسعود (1387)، بررسی علل عدم حمایت اسپانسرها از ورزش حرفه ای بانوان شهر اصفهان، نشریه علوم حرکتی و ورزش، دوره 6،شماره 12. صص 120-111. استولد، جی کلایتون؛ دیتمور، استفان و برانولد، اسکات ایی (1388)، روابط عمومی ورزشی: مدیریت ارتباطات سازمانی، ترجمۀ قاسمی، حمید؛ کشکر، سارا؛ قلعه، ناتاشا؛ نشر علم و حرکت، چاپ اول، ص 32. الهی، علیرضا؛ سجادی، نصرالله؛خبیری، محمد؛ابریشمی، حمید (1388)، موانع موجود در توسعه جذب درآمد حاصل از حمایت مالی در صنعت فوتبال جمهوری اسلامی ایران، نشریه مدیریت ورزشی، شماره 1، صص 202-189. حسن زاده ،مهرداد(1390)،رفتار مصرف کننده در ورزش و رویداد‌های ورزشی، تهران،هنر آبی، چاپ اول، ص 168. حسینی، سیدعماد (1387)،طراحی الگوی بازاریابی ورزشی لیگ برتر فوتبال جمهوری اسلامی ایران، رساله دکتری، دانشگاه تربیت مدرس. چکیده. سیدعامری، میرحسین؛ محرم زاده، مهرداد؛ بشیری، مهدی؛ هادی، حمداله (1389)،بررسی عنصر حمایت مالی از عناصر آمیخته بازار یابی ورزشی، فصلنامه المپیک، سال هجدهم، شماره 4، (پیاپی 52)، صص 129-111. عبدالخالق، کاظم محمد (1382)،فوتبال در بورس و بورس در فوتبال، تهران، سازمان چاپ و انتشارات وزارت فرهنگ و ارشاد اسلامی، چاپ اول، ص 96. Alexander, N. (2009),Defining brand values through sponsorship. InternationalJournal of Retail & Distribution Management, 37(4): 346 – 357. Bashiri, M; Ameri Seyed,M.R Moharramzedeh H. (2010). Evaluation of Sport Sponsorship: As an Element of Sport Marketing Mix. International Review of Business Research papers, 6(1):57-74. Benekas, D. (2006),A critical evaluation of sport sponsorship effectiveness among Football audiences in Greece, Master Thesis, Department marketing, Greece. Bennett, G., Henson, R., & Zhang, J. (2002). Action sport sponsorship. Sport Marketing Quarterly, 11(3): 174-185. 12.Bibby, D. (2006),Adidas's sponsorship of the New Zealand All Blacks: the relationship between brand image and brand equity in sports sponsorship, Masters by Research, Applied Communication, RMIT University.Pp: 209 -221. 13.David Nickel, T. Bettina Cornwell, Wesley J. Johnston, (2011),Sponsorship-linked marketing: a set of research propositions, Journal of Business & Industrial Marketing, 26 (8):577 – 589. 14.Fahy, J., Farrelly, F. and Quester, P. (2004).Competitive advantage through sponsorship: A conceptual model and research propositions, European Journal of Marketing, 38(8):1013-1030. 15.Filho, W. (2009),Corporate social responsibilityin the 21st century: Some thoughts. In: S. Idowu & W. Filho (Eds. ), Professionals’ perspectives of corporate social responsibility,Berlin: Springer. pp: 409–412. 16.Gilaninia, S., & Abbaszadeh, M. R. (2011).Assessing the Constructs of Sport Sponsorship Effectiveness and Theoretical Relationships between them among Football Fans in Iran. Journal of Basic and Applied Scientific Research, 1(7):606-616. 17.Hyun Baek,T & Whitthill king,K (2011),Exploring the Consequences of Brand Credibility in Services,Journal of Service Marketing. 25 (4): 260-272. 18.Jensen, R., Bowmanb, N., Wangc Y., &Larsond, B. (2012),New league, new market and new sponsorship: an exploratory study of attitudes towards shirt sponsorship in Major League. Soccer & Society, 13(4):536-554. 19.Keshock, Chiristopher, M (2004),The effects of economic Impact Information on the attitudes of Potential Sports Sponsors Operating in Mid-size and Small College Communities, unpublished doctoral degree dissertation, Department of Sport Management, Recreation Management and Physical Education, Florida state University. 20.Kurscheidt,M & Rahman,B (2005),Local Investments and National Impact: The case of the Football World Cup 2006 in Germany, in: C. Jeanrenaud (ed), The Economic Impact of Sport Events, Neuchâtel: Editions CIES, 79-108..
21.Meenaghan, T. (2001),sponsorship - legitimizing the medium, European Journal of Marketing, 25(11): 5-10. 22.Mikhailitchenko, A. G., Tootling, D. H., Mikhailitchenko, G. N. (2012),Exploring saturation levels for sponsorship logos on professional sports shirts: a cross-cultural study. International Journal of Sports Marketing and Sponsorship, 13(4):267-281. 23.Papadimitriou, D. Apostolopoulou, A & Artemisia, D. (2008),Event Sponsorship as a Value Creating Strategy for Brands,Journal of Product and Brand Management, 17(4):212 –222. 24.Simon, J, Cliffe & Motion,J (2005),Building Contemporary Brands: A Sponsorship based Strategy,Journal of Business Research.Journal of Business Research,58 (8):1068–1077. 25.Smith, A. (2008),Introduction to Sport Marketing: a practical approach, Elsevier Butterworth-Heinemann, Oxford, London, pp: 108-110. 26.Yong Jae, k., Kyoungtae, K., Cathryn C. & Tae Hee, k. (2008),The effects sport involvement, sponsor awareness and corporate image on intention to purchase sponsors' products. International Journal of Sports Marketing & Sponsorship, 9(2):79.